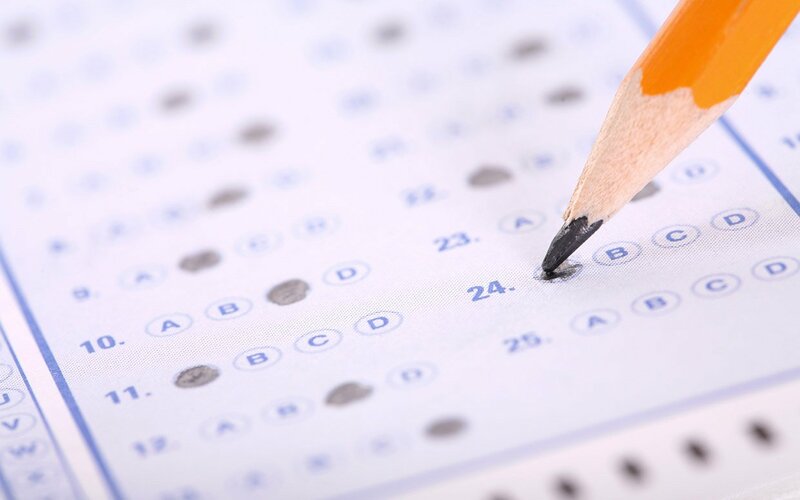 Multiple choice questions (MCQs) have always been popular in maths in some parts of the world. 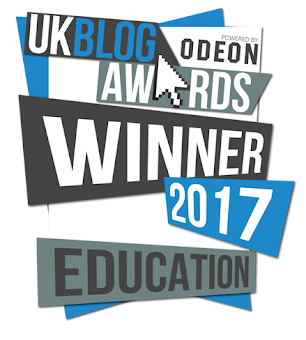 In recent years they have gained popularity in England and Wales, and are now commonly used as a diagnostic tool in the classroom. 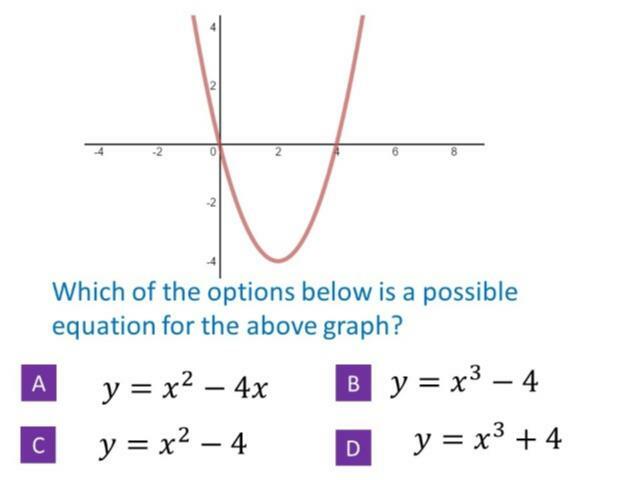 MCQs are also now a key feature of AQA's GCSE papers. Some teachers have been asking where they can find MCQs that are aligned with our curriculum. 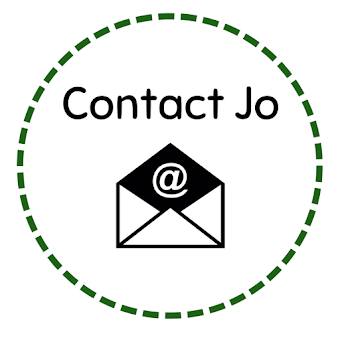 I've listed some sources below - if you have anything to add, please email me. Suitable for Key Stage 3 and 4. I found these multiple choice quizzes at work - I believe they were written by Julie Bolter, probably to accompany a textbook. 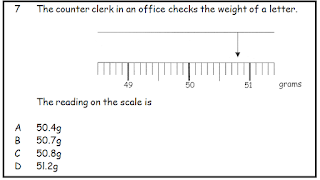 There are quizzes for a number of topics including sequences, standard form and coordinates. There's a large selection of multiple choice questions here, both in PowerPoint and Word. The topics are mixed so these would be useful for exam revision or retrieval practice. Thanks to Mitesh Patel for sending me these. We don't know the original source so please tweet or email me if you know. Suitable for Key Stages 1 - 5. 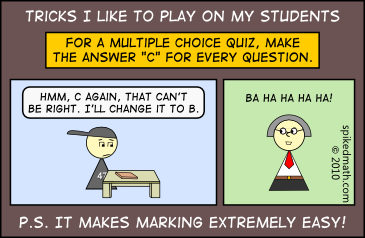 This fantastic website from Craig Barton has a huge range of multiple choice questions, contributed by users. 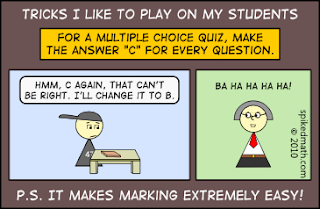 You can quickly create quizzes for use with mini-whiteboards, voting cards or Plickers. The most powerful aspect of this website is the opportunity to set students quizzes online - this allows teachers to read explanations and therefore analyse students' thinking. It's worth checking out the ready made quiz collections including quizzes from White Rose, UKMT, Edexcel, AQA and OCR. 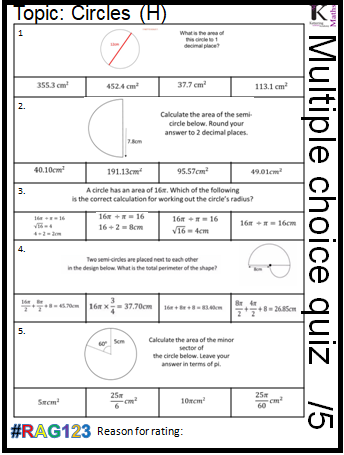 Grace Horne, who is Head of Maths at Kettering Science Academy, has sent me her amazing set of multiple choice quizzes. She's made 85 consistently formatted quizzes, each containing five questions drawn from diagnosticquestions.com. Quizzes are categorised by topic and GCSE tier. Answers are provided. 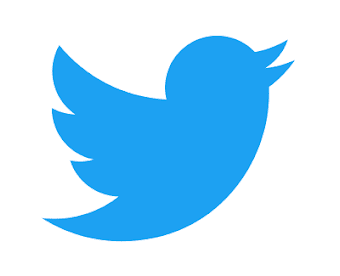 This is a very helpful resource! Huge thanks to Grace for sharing this. Suitable for Key Stage 5. The Scottish Qualifications Authority used to set Objective Tests for Higher Mathematics. 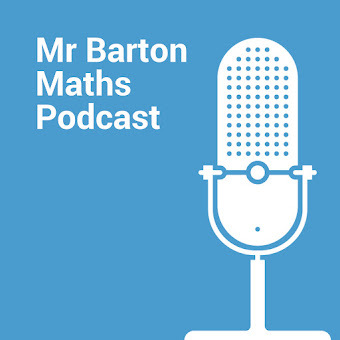 These contain lovely questions for Year 12 and 13, covering topics such as calculus, trigonometry, sequences, vectors and the equation of a circle. Thanks to Helen Dey for telling me about these. Thanks also to @mrallanmaths for sharing this editable bank of Objective Test questions. 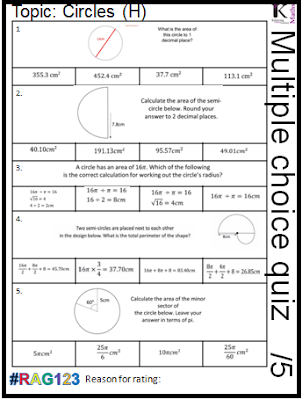 MEI provides a great selection of multiple choice tests for A level Maths and Further Maths on Integral (school login required). 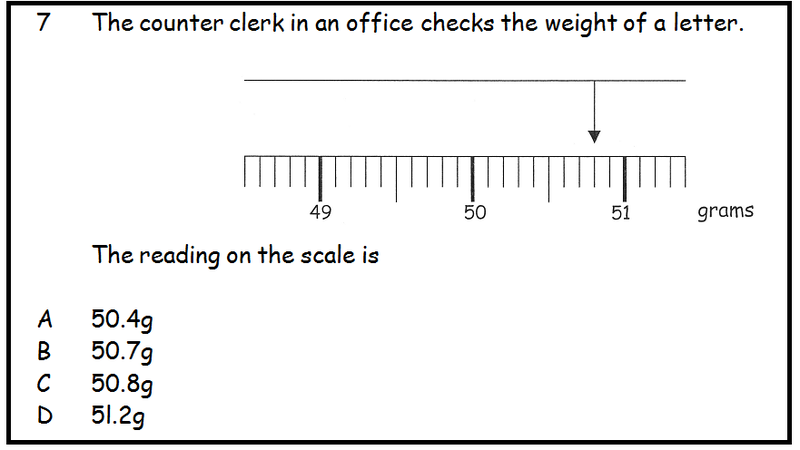 The example below is from a Normal Distribution assessment for Edexcel S1. Ben Cooper (@bcoops_online) on TES provides a PowerPoint of 30 multiple choice quizzes for various number topics including fractions, decimals and percentages. Thanks to Jon Treby for this set of Functional Multiple Choice Questions. They are split by topic and all questions are contextual. Suitable for Key Stage 4. 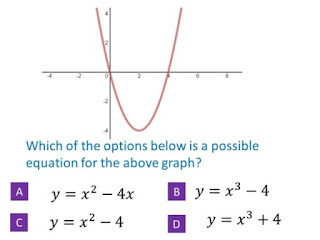 Stuart Price (@sxpmaths) wrote a post about using multiple choice questions from Foundation of Advanced Mathematics exams for Year 10 revision competitions. 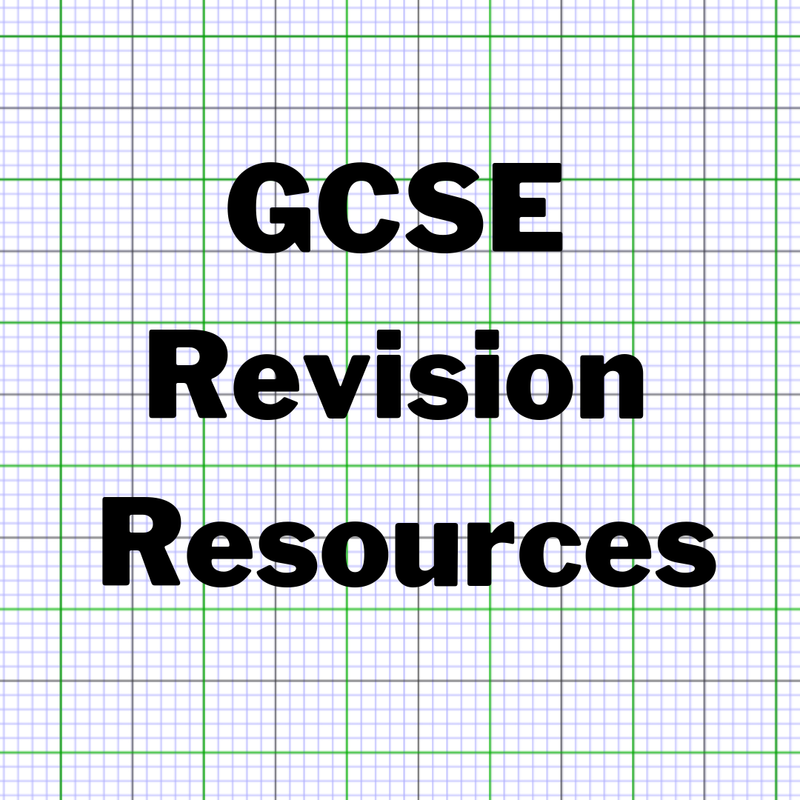 There's a number of past papers to draw questions from - most of the topics are from GCSE and the questions are suitable for extension in Year 10 and 11. There's lots to explore here! 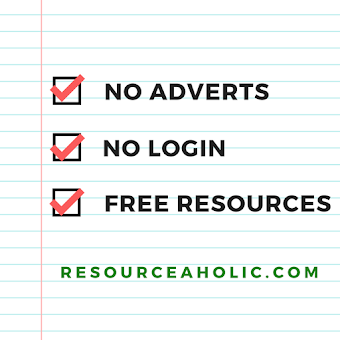 If I've missed anything, please email it to resourceaholic@gmail.com. Thank you! Thanks to @stroevey for providing a large set of MCQs from Australia. There's loads here that I need to look through but at first glance I saw MCQs suitable for Key Stage 3, 4 and 5. After this post was published Don Steward started producing multiple choice questions - http://mediandonsteward.blogspot.co.uk/.